New Tube for London (NTfL) is a programme that would introduce new trains and signalling on several London Underground lines between 2025 and 2033. The trains may not have drivers, however the ASLEF and RMT trade unions that represent the drivers strongly oppose this, saying it would be unsafe. – Bakerloo line capacity could be increased by 25 % with 27 tph at peak times (by 2033). The new design features enhanced accessibility, with step-free platform access, walk-through carriages and wider doors. 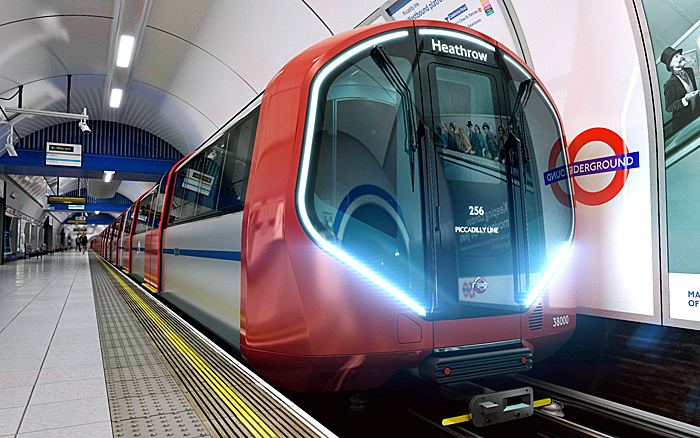 In addition, the new trains will have air-cooling for the first time on deep-level sections of the Tube. The fully automated trains may not have drivers, however the ASLEF and RMT trade unions that represent the drivers strongly oppose this, saying it would be unsafe. Londoners are already seeing huge improvements on the Tube network, with faster and more frequent journeys on the Jubilee and Victoria lines, the modernisation of the Northern line nearing completion this year, and new walk-through, air-cooled trains on the Circle, Hammersmith & City, Metropolitan and part of the District lines. The new fleet (250 new tube trains), which is expected to cost up to £2.5 billion, will be rolled out in preparation for London’s expected population growth, which is projected to rise from around 8.4 million people today to an estimated 10 million by 2030. When the trains join London’s Underground network, they are planned to be in service for 40 years. The Invitation to Tender for the trains is expected in early 2015, the specifications for the Piccadilly line infrastructure in 2016, and the first train to run on the Piccadilly line in 2022. Ansaldo STS MacroLok presented as the the Interlocking solution of the future ETCS over GPRS: how, when and why! Es lo que se necesita: trenes totalmente automatizados!